Blast Arcade and Laser Maze BLASTED OFF to a grand opening June 2012! 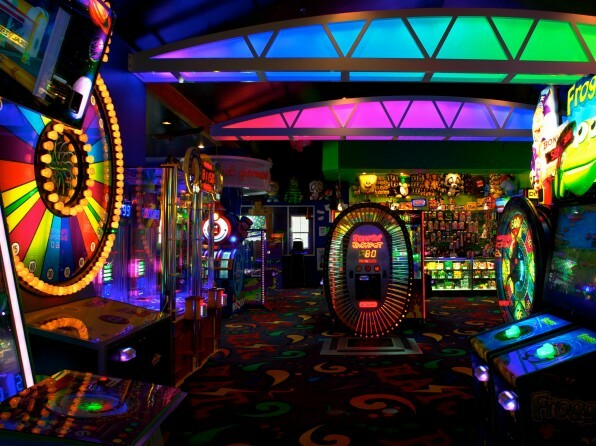 If you are looking for fun things to do in Sandestin, Destin, around 30A, or Santa Rosa Beach, Blast Arcade and Laser Maze is an exciting, fun filled entertainment center located in Sandestin at The Village of Baytowne Wharf that will surely have the entire family coming back for more. Our Arcade has over 50 redemption and video games, delivering the latest in high tech family fun. There are games designed to entertain all ages and are the latest and greatest! Put on your best Tom Cruise imitation and try to navigate thru our amazing Laser Maze, a unique room of colored laser beams that players must negotiate their way through….and aim for the highest score. Players choose a level of difficulty and dart through beams! Periodically we’ll host laser maze tournaments. Don’t forget to visit Rootin Tootin in our Blast’ Em Shootin Gallery. This gallery contains characters that come to life when “shot”. While fun for the sharp shooter, the gallery is also designed to entertain guests in its animated and theatrical display! We have signature characters: Thunder, Lightning and Rootin Tootin who will guide you thru all of our exciting adventures. Our birthday party room seats 40. Because we have so many excellent cuisine choices throughout the Village, guests can order any food and have it delivered for their parties and events! Todd and Kitty Whitney, and their 7 year old son, Max, welcome you to a new era of family enjoyment. “We have lived in Sandestin for 12 years. It has become a family focused resort. We are so happy to bring another dimension to our locals and tourists as they experience the benefits of the emerald coast” reports Todd Whitney, creator of BLAST. Come and experience the new addition to the Village at Baytowne Wharf….and don’t forget to have a BLAST! !